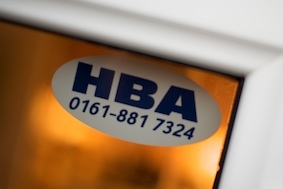 HBA installs and repairs domestic and commercial burglar alarms and CCTV systems all over Manchester and beyond. HBA ALARMS is a family firm, run by Ian & James Henderson. The firm was established in 1977 by Ian and since then we have installed, repaired and serviced thousands of systems. We have worked for clients in the tallest penthouse in Manchester, to the smallest of buildings imaginable, and the full range of homes in between. We have worked with and continue to work with some of the country's leading PLCs. We have yet to come across a problem that a client may have, that we have not been able to advise on and solve. We also work with a number of leading property developers and property agents and these are relationships that we have maintained over many years. We do not advertise our services and are extremely grateful to our clients who continue to very kindly recommend us. No problem - we can fit a small button close to the front door - when pressed it instantly sounds the alarm inside and outside the house alerting neighbours and warding off unwanted visitors. No problem - our discreet pet friendly sensors replace your existing units allowing you to set your alarm system with pets free to roam, safe in the knowledge that your home is fully protected. No problem - with our wire-free remote secure sensors - no wires no fuss - just peace of mind that your belongings are safe and secure. Wireless sensors can be retrofitted to any existing system. No problem - we can fit a digital dialler to your existing or new system that will send a message to you on your mobile phone, alerting you should the alarm be activated - giving you peace of mind whilst away from home - we can even set it up so that you can listen in or send a real time audible message to your home.